Ah alast, the bulk of Tryouts is behind us; however, there are always a few teams that could use that one or two more players to help round out their roster. To that end, the list below provide info about those opportunities. More to come! Please check back. U11 Girls (2006s) – Please contact Coach Bev Underwood at 813-638-3254 or Bev_underwood@icloud.com. U12 Girls (2005s) - Please contact Coach Bev Underwood at 813-638-3254 or Bev_underwood@icloud.com. U13 Boys (2004s) Premier - Please contact Coach Kyle McLeish - 813-205-4239 or Kyle.mcleish@email.saintleo.edu. U14B (2003) additional team is looking for a player or two. Please contact Coach Rey Villalba 727-418-0730. 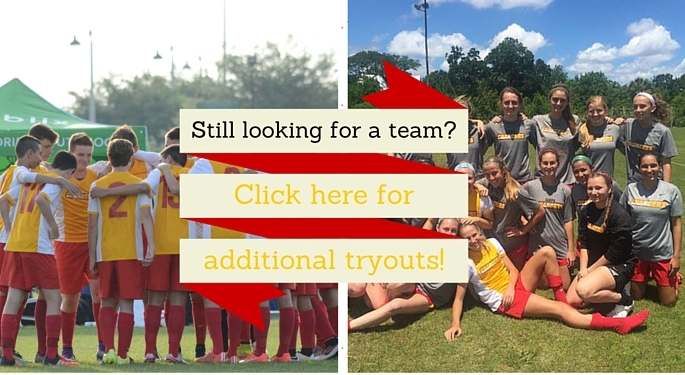 U16 Girls (2001) – is looking for 2 more players. Please contact Coach Ed Lynch at lynchuconn@aol.com. U17 - U19 Boys (1998-2000s) - Coach JP Peterson will be hosting the session on Saturday June 11 at 10am at the Premier Sports Campus. For more questions, please contact Antonio Saviano at 910.231.1070. U16 Boys (2001) - has one or two more openings. Please contact Mahlon Sullivan marlon09us@yahoo.com or Juan De Brigard boysdoc@floridahawksfc.com. U18 Girls (1999) is looking for a goalkeeper! Please contact Peter Gutsche at petr.gutsche@gmail.com.